Do you need another charm for your charm necklace or bracelet? 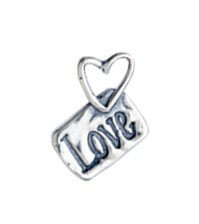 Our Silver Love Heart Tag Charm is a great addition. The Heart Love Tag Charm is a unique charm that will express your love. This sterling silver charm will make a great addition to any chain or bracelet. The charm is approximately 5/8" x 3/4".